The paper, “Online Reinforcement Learning Control for the Personalization of a Robotic Knee Prosthesis,” is published in the journal IEEE Transactions on Cybernetics. First author of the paper is Yue Wen, a Ph.D. biomedical engineering student at NC State and UNC. Additional co-authors include Andrea Brandt, a Ph.D. biomedical engineering student at NC State and UNC; and Xiang Gao, a Ph.D. student at ASU. The work was done with support from the National Science Foundation under grant numbers 1563454, 1563921, 1808752 and 1808898. Abstract: Robotic prostheses deliver greater function than passive prostheses, but we face the challenge of tuning a large number of control parameters in order to personalize the device for individual amputee users. This problem is not easily solved by traditional control designs or the latest robotic technology. Reinforcement learning (RL) is naturally appealing. The recent, unprecedented success of AlphaZero demonstrated RL as feasible, large-scale problem solver. However, the prosthesis-tuning problem is associated with several unaddressed issues such as that it does not have a known and stable model, the continuous states and controls of the problem may result in a curse of dimensionality, and the human-prosthesis system is constantly subject to measurement noise, environment change, and human body caused variations. 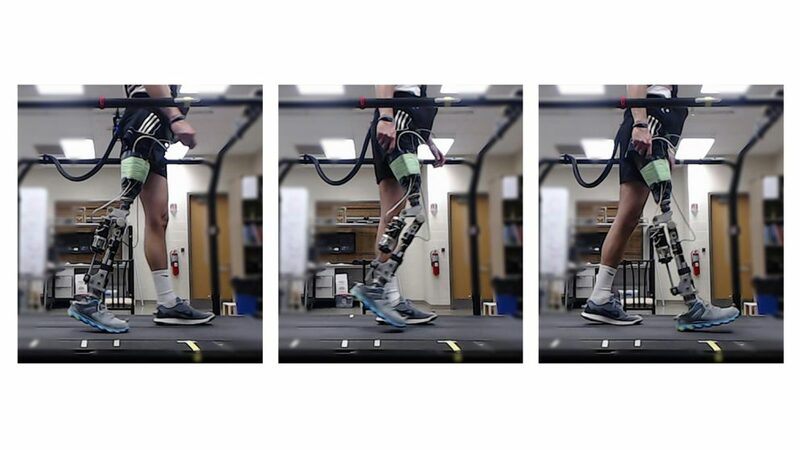 In this study, we demonstrated the feasibility of direct Heuristic Dynamic Programming (dHDP), an approximate dynamic programming (ADP) approach, to automatically tune the 12 robotic knee prosthesis parameters to meet individual human users’ needs. We tested the ADP-tuner on two subjects (one able-bodied subject and one amputee subject) walking at a fixed speed on a treadmill. The ADP-tuner learned to reach target gait kinematics in an average of 300 gait cycles or 10 minutes of walking. We observed improved ADP tuning performance when we transferred a previously-learned ADP controller to a new learning session with the same subject. To the best of our knowledge, our approach to personalize robotic prostheses is the first implementation of online ADP learning control to a clinical problem involving human subjects.